Wetlands in eastern North Carolina. Environmental groups say the wood pellet companies like Enviva could harm plant and animal life there. Enviva says it takes steps to protect the environment. Environmental groups say a wood pellet mill in eastern North Carolina is threatening sensitive forests. 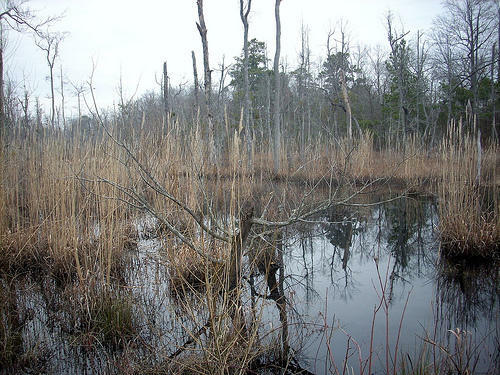 A report and series of maps from the Natural Resources Defense Council and Dogwood Alliance says the company Enviva is clear-cutting wetland forests for wood near its facility in Ahoskie. Enviva breaks down wood material to pellets and sells them to European countries, which burn them to generate electricity. The groups say Enviva is using whole trees in addition to tree tops or limbs. "The maps show that these forests are pretty fragmented already, that they are surrounded by an ocean of pine plantations, and that those ecosystems provide critical services in a landscape that's already been highly degraded," says Danna Smith of the Dogwood Alliance. Enviva says the company is not clear-cutting and only uses whole trees if they don't meet higher standards for furniture or lumber. "Enviva's sources of raw materials are exactly what folks like the NRDC and the Dogwood Alliance are calling for; tops, limbs, residuals and other parts of the harvest," says Enviva spokeswoman Elizabeth Woodward. "We take very low-grade wood fiber. We take wood that would not otherwise be used and probably leave less on the ground to rot." Enviva and the environmental groups are also in a dispute over whether burning wood pellets is cleaner than burning coal. Enviva has two mills in eastern North Carolina that produce 865,000 tons of wood pellets a year.